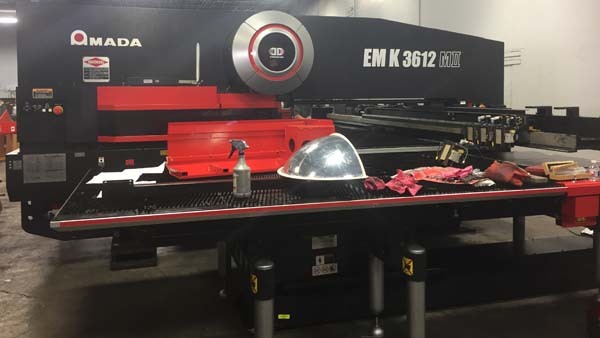 RIVERDALE, N.J.–EVS Metal recently took delivery of its latest piece of high-tech fabrication equipment at its Pflugerville, Texas, precision metal fabrication facility–the Amada EMK 3612 M2 turret punch press. EVS Metal said in a press release that with four built-in tapping stations, the EMK is one of the most efficient turret punch presses available. It is able to process 10-foot by 5-foot metal sheets without repositioning and is said to have the highest real-world hit rates and ram positioning accuracy of any similar machine on the market. The EMK also features electrical power savings of as much as 70 percent over typical hydraulic machines, and twin servo drives offering a sizable reduction in maintenance and repair expenditures. The EMK will be used in concert with the ASR 3015N TK material handling system. This means EVS operators can now take a traditionally labor-intensive fabrication process and automate it almost entirely as one continuous operation. "Now, instead of manually handling parts, the ASR simply places them back into the tower so they're ready and available for secondary fabrication or finishing processes," said EVS Metal General Manager Bob Evans. Another powerful benefit of the ASR, the company said, is that it eliminates the need for operators to wait for an entire sheet to be processed before a part can be handled. Sheets of different metal types can now be run concurrently because the ASR is capable of picking individual items, rather than having to use an entire pallet of a single material before moving on to the next. But the biggest benefit of pairing the ASR with the EMK turret press is that it will allow for unattended, lights-out punching operation–a massive upgrade in productivity. "Investing in top-of-the-line fabrication equipment like the Amada EMK punch press demonstrates EVS's dedication to lean manufacturing principles, such as one-piece flow, in particular, when it is used with the ASR," said Joe Amico, vice president and co-founder of EVS Metal, in the release. "It greatly increases efficiencies and operating productivity while decreasing costs, which allows us to ultimately pass these savings down to our customers in the form of fair, consistent pricing, always-on-time production, and an unwavering commitment to quality." EVS Metal (www.evsmetal.com) is an American precision metal fabricator headquartered in Riverdale, New Jersey. The company reports that its machinists and operators use the latest technology to cut, bend, and finish stand-alone items, as well as parts for integration or assembly into more complex products. Its four ISO 9001:2015-certified locations comprise over 250,000 square feet of vertically-integrated manufacturing space and feature equipment ranging from e lasers and CNC machining centers to automated powder coating lines.